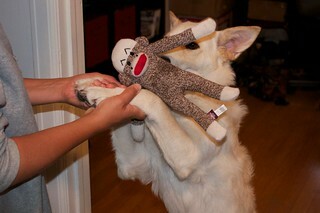 The Sock Pals Monkey by Multipet was an instant hit. This didn’t come as a surprise, since Balki loves getting new toys. Days later, he was still picking up this toy over his other ones. The sock monkey doesn’t have a whole lot going on; it’s just a plush toy with one squeaker. I was worried that it would become exceedingly difficult to find toys to his liking, especially after giving him numerous unique and multi-functional ones. I was delighted that he enjoyed the sock monkey so much. Maybe it is the monkey’s lengthy arms, legs, and tail that he is keen on. Or maybe it is just that the toy reminds him of the socks that he pulls out of the hamper, which he still loves to do. Either way, it’s a good toy and the price was reasonable. He did manage to almost rip the tail off after just one day, but he was super determined to do so and it doesn’t appear that the whole toy will unravel once it comes off. Pleasantly surprised!